NOTICE: Activation key must be used on a valid Steam account, requires internet connection. 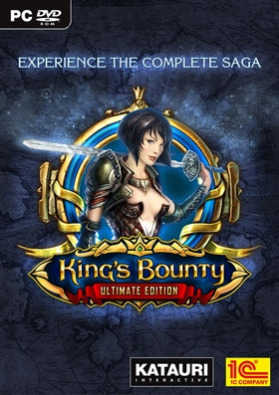 ABOUT THE GAME	King’s Bounty: Ultimate Edition King’s Bounty: The Legend (available in EFIGS) King’s Bounty: Armored Princess (available in EFIGS) King’s Bounty: Crossworlds (available in EIGS) King’s Bounty: Warriors of the North (available in English and German) King’s Bounty: War… riors of the North - Ice and Fire (available only in English) King’s Bounty: Dark Side Premium Edition (available in English)	BONUS MATERIALS: Artbook (70 pages of artworks from the games) Soundtrack (MP3 format)SYSTEM REQUIREMENTS Minimum: Operating System: Windows XP / Vista / Win 7 Processor: 2.6 GHz Memory: 1 GB Video card: NVIDIA GeForce 6600 with 128 MB or equivalent ATI Sound card: DirectX-compatible soundcard Hard disc: 20 GB free hard disk space CD ROM: PC DVD-ROMRecommended: Operating System: Windows XP / Vista / Win 7 Processor: 3 GHz Memory: 2 GB Video card: NVIDIA GeForce 7950GT with 512 MB or equivalent ATI Sound card: DirectX-compatible soundcard Hard disc: 20 GB free hard disk space CD ROM: PC DVD-ROM Compatibility: Windows XP / Vista / 7 / 8 / 8.1 / 10 © 2015 1C Company. All rights reserved.